Only One of the Twenty-three Hardy Horseneck Boys, who took Famous Trip on Ice, Known to be Alive Now – Some History of the Participants and Account of the Jaunt Told by Hon. Seaman Mead. Fifty-five years ago this winter, Long Island Sound was completely frozen over from the Connecticut and New York shores to the Long Island shore. This was the only time, in the memory of even the oldest resident of the vicinity, when the eight mile expanse from Greenwich to the Long Island side was one glade of ice. Men who are gray-haired and feeble to-day do not remember having heard their sires tell of the Sound being frozen from shore to shore and it is unlikely that the occurrence will ever transpire again. It may not be generally known or perhaps not easily recalled to-day that in the winter of 1857 a party of twenty-three hardy Horseneck lads made the trip across the Sound and back on the ice with safety. The lads were all near manhood's estate and one or two of them were close on to thirty. Of the twenty-three, only one is now known to be alive. He is the Hon. 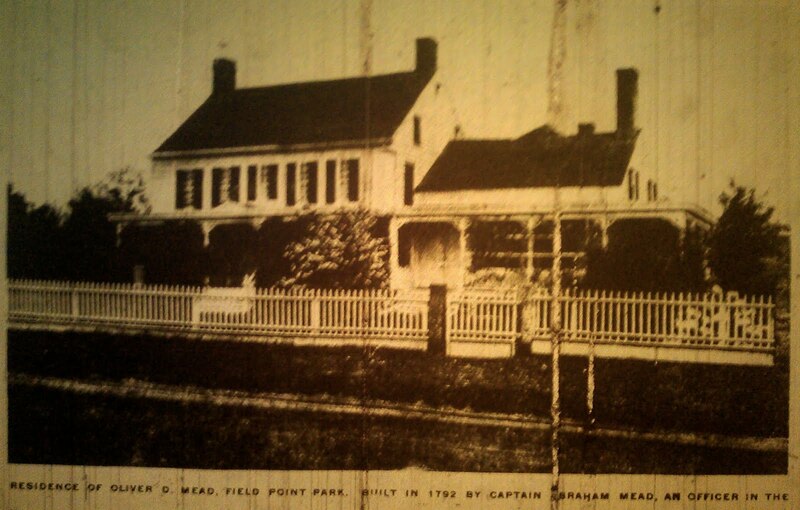 Seamen Mead, who resides with his family in a cosy residence at No. 151 West Putnam avenue, Greenwich. When visited by a Daily Item reporter, Mr. Mead, who has ably represented Greenwich in the Assembly of the Nutmeg state, was comfortably seated in a big chair in his well-appointed library. Despite his seventy-five years, he came forward with a firm tread and held out a steady hand to greet his visitor. Despite his years, Mr. Mead's memory is remarkably keen, even concerning the events of his boyhood, and he could doubtless have related interesting occurrences of the days gone by that would easily fill to overflowing a book of no mean dimensions. But the visitor was bent on learning something of that remarkable jaunt across the frozen Sound more than half a century ago, and on making known to Mr. Mead the object of his visit, the latter smiled and with the cordiality which has been a lifetime characteristic of him, agreed to relate the incidents of the trip across the ice-covered Sound as well as he could remember them. "The winter of 1857 was one of the most severe that I can recollect," said Mr. Mead in beginning. "The first snow fell around Christmas Day and the ground remained covered until the 20th of March. I can remember quite well how Field Point road was blocked with five feet of snow and the folks down in that section were unable to get thru the roads for many weeks. You could not tell where the fences were and it was with the greatest difficulty that the people got around. "The heavy snow filled up the Sound with slush, so that when a severe cold snap followed the storm, the entire Sound froze over. One day some of the boys got talking about walking across the Sound. I think it was Daniel Merritt Mead who planned the trip. We were already to attempt the adventure and discussed it in Peter Ackers grocery for several days. Matthew Mead, who kept a cobbler shop, offered to make straps for our feet. He took pieces of leather and drove brads thru them, and these we were to fasten to our shoes. I think Pete made twenty, for there were two or three who did not have them, and they were laid up to two or three days in bed, they were so lame and sore after the trip. "We finally set the day on which to take the jaunt. The thermometer have been down to ten below zero for several days and the Sound was safe. We did not tell her parents where we were going. I think that Peter Acker and the cobbler were the only ones outside of the party who knew what we were up about. The day before, we made up that everyone who was going was to meet at the old boat landing at the point about where the Indian Harbor Yacht club house is today. "The day, I think it was Saint Valentine's Day and a Saturday, was clear and sharp. Six or seven of those who had said they would go did not show up at 9:30 o'clock, the appointed time, but twenty-five did meet as we had planned. They were Daniel Merritt Mead, Thomas Mead, Stephen Marshall, Stephen White Charles Seaman, George and William Funston, Luther Homes, Stephen Stoothoff, Elnathan Husted, Donald S. Mead, Isaac Weed, John Elliot, Samuel Bush, Hugh Funston, Samuel A. Lyon, Selah Guernsey, Silas D. Benson, Whitman Lent, William Farrington, Benjamin Yarrington, William Wallace, Elam Mead, Joseph Peck and myself. "All of us who could skate carried a pair with us. Those who could not skate took their sleds and we were to draw them along while we skated. Ten or a dozen of us had ropes about thirty-feet long, coiled up and thrown over our shoulders or wrapped around our waists. It was about ten o'clock when we set out. For a little way we kept up along the shore and then we struck across and kept to the east of the little island. "On the way across we found the ice very rough and we were unable to use our skates much of the time. When we had got a little way out, Elam Mead and Joseph Peck got frightened and went back. But the rest of us kept on. About midway across we came to a crack about two or three feet in width, that extended for some distance. Some of us jumped across but the rest walked around the fissure and this took those some distance out of their way. "When we got pretty well across, we found the ice smoother and were able to skate a little. We pulled those who didn't have skates along on their sleds. We touched at the Long Island shore at Huntington Bay and then struck down the Sound for three or four miles. We found the ice better there and were able to skate nearly all the way. "We were told that we would find that we could make better progress by striking directly across and did so, getting back to this side without accident coming in the shore off Rye. Then we kept in rather close to the land all the way to Greenwich. The ice was thick enough to hold us anywhere, but we found we could skate better close to shore. "It was about three o'clock in the afternoon when we got back home. I know my parents were worried. I had not told them where we were going and when I had not come home for dinner they begin to get anxious about me. When my father learned of the trip we had taken, he was glad, but mother didn't think that way. "On getting back, we learned that Peter Acker had followed us with a spy glass he had. He said that he had been able to see us all the way, save for a little while that we were in close to shore on the way back. He sat in the back of his store, from the rear window of which he had a fine view. "I remember too about the great bobsled we had that winter. The _now was packed well for coasting and on here on the Boston turnpike hill we had a path made. We went easily from where James Walsh's house is up there down to the Mongon house. They hill was much steeper than now. George Ray owned the bob. It was made in old Joseph Russell's carriage shop and coasting parties came here from Norwalk, Stamford and many other places, but they couldn't beat us. I remember how Bill Ward, father of William L. Ward, had four or five sleds made in his shop to be ours, but none of them could do it. 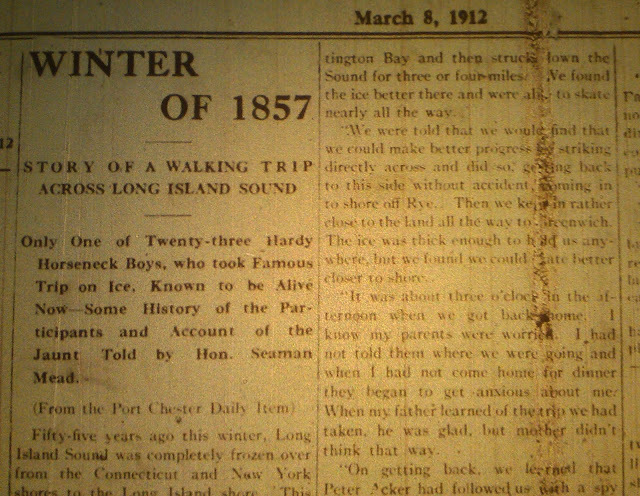 "You'd like to know what became of the lads who made the trip across the Sound on the ice? Well, as far as I know I am the only one living. Daniel Merritt Mead began to practice law here and went out as major of the Tenth Connecticut; Thomas Mead was second lieutenant of the same company; Stephen Marshall, as you probably know, went to Port Chester and was a justice of the peace there for many years; Stephen White became captain of the 'John Romer,' a boat operated by the Tweed Company; Charles Seaman, my uncle, remained here for some years; the Funston boys went away and I think one of them was killed in the war and the other died a few years ago; Luther Holmes became a pilot in New York harbor; Stephen Stoothoff was a carpenter by trade and the leading housemover of this section in his time, and died last fall aged eighty-two or three; Elnathan Husted served in the Seventeenth Connecticut and ran a coal yard at the Point for many years; Daniel S. Mead was a judge of probate here and town clerk; Isaac Weed whom many folks thought was Jake Weed's son but who came from another family of that name, went to New York; John Elliot, whose father was depotmaster here ran a stage around the village for years; Sam Bush became the sea captain and went away; Hugh Funston went away from Horseneck, too; Samuel A. Lyon was the father of Fred Lyon, editor of the NEWS and served in the Tenth Connecticut; Selah Guernsey worked at the carpenter trade; Silas D. Benson went away as captain of Company I, Seventeenth Connecticut, and I think he died during the war; Whitman Lent engaged in business in New York, his father having conducted a carriage shop on Sherwood Place; William Farrington, whose father was a painter for old Mr. Lent, left the vicinity when a young man; Benjamin Yarrington was a nephew of Rev. Mr. Yarrington, an Episcopal minister and lived with his uncle a part of the time and went home from school; William Wallace was stationmaster here for some time afterward became assistant superintendent of the New Haven railroad. "'Did I served in the war?' No, I enlisted, but was sent back home because of the weak knee. I hurt it while a young lad and it disqualified me from joining the army." As the interview between the veteran resident of Horseneck, as Greenwich was formally called, and the reporter was drawing to a close, the passing of innumerable autos caused the conversation to turn to this motor vehicle of the present day. "Yes, I've got an automobile," said Mr. Mead, "but I would not sell our old horse for anything. You can't depend on these new inventions. Why, only last Wednesday, in that severe storm, an auto party was held up on this hill for over an hour while the driver of the car was wrestling with the tire. I believe in sticking to the horse even if it is a little old-fashioned." Source: Greenwich Graphic. February 28, 1903. Page 1. In an interview this week with Milo Mead, the "Sage of New Lebanon" he showed that not much in the Ridgefield Road situation had escaped him. For years Mr. Mead has been urging the building of the Ridgefield Road and is now as much in earnest as ever, although just at present he is not inclined to express his views fully. "We don't know yet where the land lies," he said, "so we cannot talk much to the point." 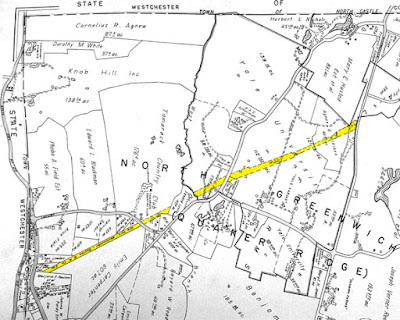 It is rumored that person in Greenwich holds most of the stock, and another story has it that it belongs to the New Haven road. Who owns it I do not know therefore I do not know how soon the road may be built or why the work has been delayed so long. Judging from the past it is right to suppose the road would never be built as long as the present company could get a time extension from the legislature. "But there are two sides to the question," says Mr. Mead. "Should the legislature secure an assurance that the road would be built by the present company, before a certain time yet there would be nothing to bind the company to perform the work. If, on the other hand the legislature refuses to extend the charter to this company we have no direct assurance that another company will take up the project and build the road. No one as yet has made a move to secure the charter for building a road over this section, although it is rumored that other companies are ready to do so." "Whatever course shall be taken the first subject should be to secure a road as quickly as possible. The agitation of the matter is a good thing and I am glad to see it. It should result in an awakening of interest which will eventually push the road through." "A railroad through the district over which the Ridgefield road was intended to run would open up many beautiful summer sites and would undoubtedly result in an increase in the value of the land along the road. The farmers along the line would be much better able to get their produce to market and would therefore be greatly benefited. There is every need of the road and it ought to be built." In article written for the Ridgefield Press some years ago Mr. Mead expressed his opinions in regard to the road and they are much the same views he holds at the present time. "The growth of East Port Chester or New Lebanon as now called has been quite rapid in the last few years. In 1886 there were only five houses along the shore, while at the present time this land is almost covered with fine summer houses. "During the past few years a new church has been erected and an iron foundry has been built and put in operation. This foundry is owned by Taylor and Hanson and employs about twelve men. A new foundry is being put up by Abendroth Brothers of Port Chester on this side of the river and will employee about seventy hands. The village has grown fast and business is increasing. At present the building outlook is not so sharp on account of the demands of the carpenters, which are entering into the construction question all about this section." Source: Greenwich Graphic. March 7, 1903. Page 1. The Board of Burgesses met for their regular monthly meeting at their rooms last Tuesday evening. Several matters came up for consideration at this meeting, among them the question of the fire alarm system. Mr. B. E. Mead offered a suggestion to the Board for a change in the system. His suggestion was that the town be divided up into well-defined sections and each section should have a number. 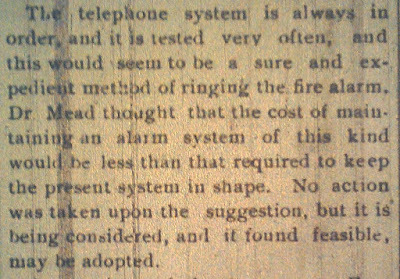 He thought the switchboard might be placed at the central telephone office and operated by central. The notice of a fire in any district could then be telephoned to the central office and the fire alarm be run by plugging the board. 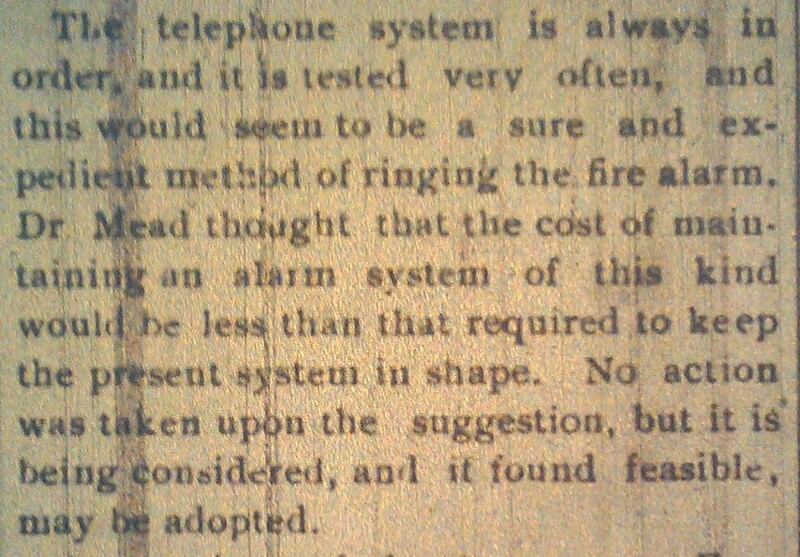 The telephone system is always in order, and it is tested very often, and this would seem to be a sure and expedient method of ringing the fire alarm. Dr. Mead thought that the cost of maintaining an alarm system of this kind would be less than that required to keep the present system in shape. No action was taken upon the suggestion, but it is being considered, and if found it feasible, may be adopted. A committee of the Amogerone Fire Company appeared before the Board asking for a bowling alley for their engine house. The Board seems to have had in mind, for some time, a place for Amogerone where they could hold their meetings, and in which there would a bowling alley and other opportunities for amusement. The matter has not yet been settled, but it is probable that something will be done soon. The other business of the evening was mere routine, consisting of the reading and acceptance of the bills for the month, and the other regular monthly work.